Finance Minister Pravin Gordhan on Tuesday spoke of the “higher good” and reassured Parliament’s standing committee on public accounts that government had money to pay social grants from April 1 and that the last hurdle would be who would be legally appointed to do so. But MPs struck another vein in the SassaGate saga which explains, in part, how the crisis came about. Treasury on Tuesday confirmed that it had not approved R45-million ultimately spent on “work streams” headed up by some members of an earlier advisory committee, hand-picked by Minster Bathabile Dlamini to recommend a future payment system. These work streams ran a parallel process to work done by Sassa officials in preparation to take grant payments “in-house” and appear to have been key in negotiating with CPS for a new contract. By MARIANNE THAMM. It was Scopa chair Themba Godi who pointed out the obvious at Tuesday’s hearing where Minister of Finance, Pravin Gordhan, presented Treasury’s role and position on various issues pertaining to the social grants crisis. Godi was, of course, referring to a high-level Ministerial Task Team that was hastily appointed on March 9, chaired by Minister in the Presidency, Jeff Radebe, and which is now overseeing the last-minute rush to conclude some form of a legal deal that will enable the payment of grants to some 17-million beneficiaries on April 1. Gordhan, who often referenced a “higher purpose” to SARS officials when he headed the revenue service between 1999 and 2009, did so again on Tuesday. “Our objective is to ensure that our higher duty to the South African public is executed in the right kind of way, as far as possible within the current framework of the law and where that framework might be constraining we then we must get the courts to agree with us that as a so-called interim or temporary measure certain things are done to ensure that the payment happens,” he told Scopa. He also said that a combination of the “political system and the court system” would bring greater clarity on the issue of the payment of grants “within the next five or six days”. This would include that those negotiating a new contract with CPS should limit it to the shortest possible period and also consider alternative payment systems, including banks and the Post Office. It was the DA’s Tim Brauteseth who led Tuesday’s discussion at Scopa back to the advisory committee established by Minister Dlamini in 2013. Some of these members later ended up heading “work streams” which operated a parallel process to Sassa officials and their attempts to prepare the agency to take the payments “in-house”. “I am pleased the Sassa CEO is back with us today,” said Brauteseth, referring to Thokozani Magwaza, who was booked off sick with “hypertension” earlier this month. Brauteseth added that “you still need to account to us with regard to the R1.1-billion in irregular expenditure, so your time with us [Scopa] is not yet over”. Brauteseth said he wanted to rewind to 2013 when Minister Dlamini established the advisory committee. Dlamini, said Brauteseth, had written to then CEO Virginia Petersen ordering her to retain the services of some of the members. Brauteseth asked whether it was appropriate for the minister to appoint members of the advisory committee as work stream leaders as this would amount to her having predetermined who “got” the work. The bill for this ultimately tallied R45-million. He asked whether Treasury thought it appropriate that members of the advisory committee were then appointed to head up work streams and whether this had been approved where there had been no competitive bidding process. In the end, while five work streams had been established, only three were functional, including Legal and Regulation, headed by Tim Sukazi [who now acts as legal counsel for Sassa in its Constitutional Court challenge], Economic Development headed by Tankiso Pakkies and Business Information – which included banking – headed by Patrick Monyeki, former Home Affairs chief director of IT. Treasury’s chief director for governance, monitoring and compliance, Solly Tshitangano, on Tuesday told Scopa that the deviation for the work streams “was not approved or condoned”. In other words, this is another whack of expenditure that would be considered irregular. Ramokgopa wrote that Khoza, who chaired the committee, “will be remunerated at the level of a government DG being R2,430 an hour while all other members will be remunerated at the level of government DDG R2,145 an hour will a full day of 9 hours where more than 8 hours is worked”. The point is, in spite of the minister’s advisory committee, the subsequent work streams and the huge amounts spent on these, Sassa was still unable to assume the role of paymaster from April 1, 2017 after the irregularly awarded CPS contract came to an end. This would suggest then that these work streams contributed in some way to the chaos and delays, which has resulted now in a “manufactured emergency” and Minister Dlamini’s insistence that a new contract with CPS be negotiated. On Tuesday Gordhan said the most pressing issue at present was the payment of grants on April 1 and that an investigation into how the situation reached this critical point would be conducted at a later stage. 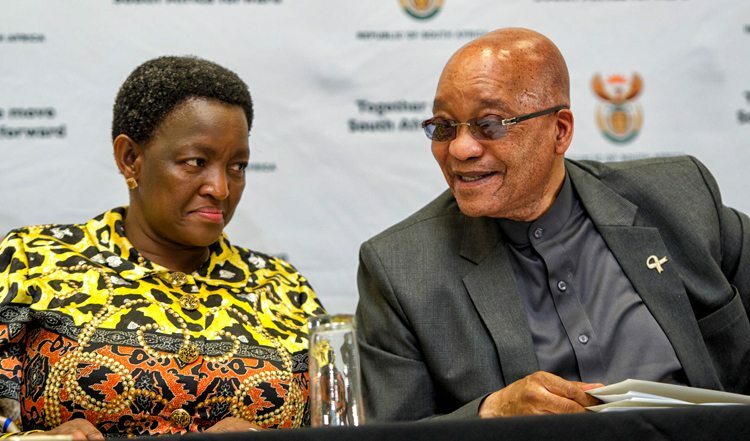 Late on Monday Sassa finally replied to a directive by the Chief Justice to provide names of officials responsible and dates that the agency and Minister Dlamini became aware that it would not be able to take over the payment of grants. The officials fingered in Sassa’s reply are the former CEO Virginia Petersen and head of Sassa’s programmes, Zodwa Mvulane. In his reply, acting CEO Wiseman Magasela said that Mvulane’s advice had been adopted by all later incumbents to the office of the CEO. Petersen was Sassa CEO until May 2016, a duty that was then assumed by Rapaahle Ramokgopa in an acting capacity from May 23, 2016 to October 2016‚ followed by current CEO Thokozani Magwaza. Mvulane had headed Sassa’s project to roll out the payment system after the Constitutional Court ruled in 2014 that the contract with CPS had been unlawful and invalid. In 2015, the agency had submitted a progress report to the ConCourt that it would, in fact, be ready to take over the payments to more than 17-million beneficiaries. After its change of plan, Sassa had filed a progress report with the Constitutional Court in March, five months after advocate Wim Trengove, SC, had advised it to make a full disclosure to the court of its change of plan. As to Mogoeng Mogoeng’s question as to “the date when the responsible person on behalf of Sassa first became aware that it would not be able to pay the grants itself by end March 2017?” Magasela replied that is was April 19, 2016. Magasela said Petersen had became aware on April 20, 2016 but left Sassa a month later. Acting CEO Ramogopa had been informed on June 10, 2016. Minister Dlamini had been made aware in October 2016 that Sassa would not be able to act as paymaster.